I would like to wish my friends, family, and constituents a very happy Thanksgiving this year. It is also my hope that we all take a few moments to think of those currently serving our country overseas and here in the US. Through their courage and bravery we have the opportunity to spend this time with our loved ones. Through their sacrifice the ideals of America continue to be safeguarded from tyranny. On Sunday, November 23rd, I once again co-hosted with House Minority Leader Brad Jones and his wife Linda our annual Thanksgiving dinner in North Reading for seniors. Hundreds of people from the community came out to enjoy the food and festivities. Sunday's dinner also featured singing from Sgt. Dan Clark, his wife Mary Colarusso, and the Senior Echoes. The event provided all of us who attended with an opportunity to join in the spirit of Thanksgiving and the appreciation of what we have in our lives. Posted below are a few photos from Sunday’s dinner. Last night at the Holten Richmond Middle School in Danvers, I attended and spoke at the first of six public hearings conducted by the Foundation Budget Review Commission (FBRC). The commission, which was created earlier this year, is seeking input from education experts, government officials and legislators, and members of the general public to assist the commission in finalizing this year’s foundation budget. The FBRC has been tasked to review the foundation budgetary process that outlines each school district’s minimum level of school spending needed to ensure a sufficient education to all of the state’s students. · Models of efficient and effective resource allocation. I sponsored an amendment that was co-sponsored by Senator Chang Diaz, the co-chair of the Joint Committee on Education, that was included in the Senate’s version of the Fiscal year 2015 state budget that created the Foundation Budget Review Commission. The amendment authorizes the FBRC to review and examine the Chapter 70 funding mechanism to ensure a more equitable funding system for the Commonwealth’s public schools. To read the law that created the commission in July, please click here (Section 124). 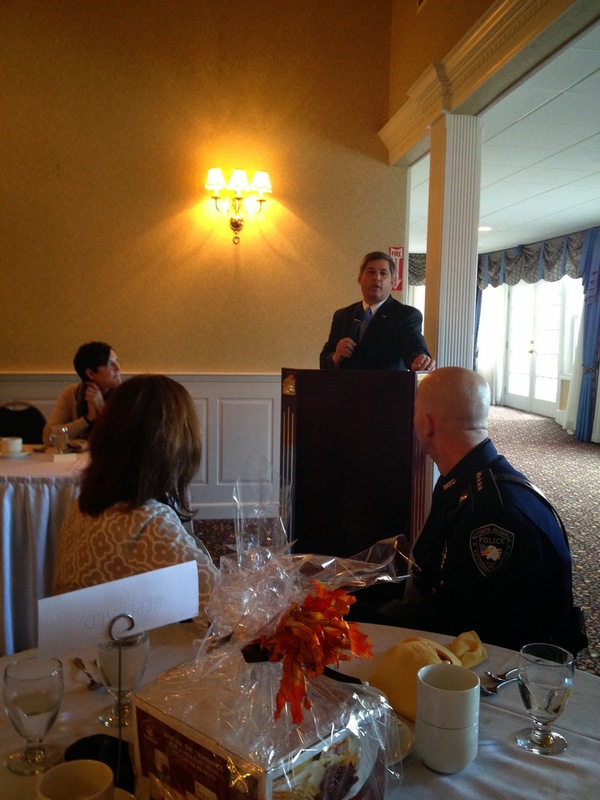 On Tuesday, November 11th, I had the honor of speaking at several Veterans’ Day events throughout my district. Those events included ceremonies in Gloucester, Wilmington, and Wenham. All of the events I attended displayed a tremendous amount of patriotism, and provided an excellent opportunity to remember and thank all those who served and continue to serve this country. Gloucester’s event, which began at the Gloucester High School Field House, featured several honorable speakers, a performance by the Docksiders, drill team demonstrations by the Gloucester High School Marine Corps JROTC, and a parade to American Legion Square, where wreaths were laid and Taps was played. In Wilmington, hundreds of town residents gathered at the Wilmington Veterans Monument located at the Town Common. The ceremony included passionate speeches from veterans, state, and local officials, performances by the Wilmington High School Marching Band, and a Governor’s proclamation presentation by Keith Jones, director of Operations for the Massachusetts Department of Veteran Services. In Wenham, a special ceremony was organized by town officials and the War Veterans Memorial Committee. That ceremony not only commemorated Veterans’ Day, but also the dedication of the town’s new Veterans Memorial, which is the result of tireless efforts by the committee and the community to raise funds from public and private sources (including state government), and to plan and build a truly fitting memorial to those who have served in our armed forces. The War Veterans Memorial Committee’s hard work paid off, and the 17 foot monument will serve generations as a place to pay respect to all those who answered the call of duty. The event also featured speeches from retired Air Force Reserves Capt. Joyce Massello, Ryan Lennon, Director of Veterans Services for the Eastern Essex District Department of Veterans Services, and state and local officials. Immediately following the ceremony, the public was able to attend a special reception. I want to thank the City of Gloucester’s Veterans Services Department, the Wilmington Department of Veterans Services, and the Wenham War Veterans Memorial Committee for their hard work in coordinating these great events. Posted below are several photos I was able to capture during the events. It is my hope that as we celebrate Veterans’ Day, we all take the time to honor our veterans for their service to this great nation. Because of their courage and bravery, the ideals of democracy continue to spread across the world. Where there’s conflict, our soldiers are there to fend off tyranny. Their dedication to freedom, liberty, and justice make our country a strong and honorable one, but their service did not come without sacrifice, and that is why we must continue to hold our current and retired military personnel in the highest of regards. Boston- “The emergency and interim measures announced today by NOAA Fisheries will be severely damaging to a groundfishery that is already struggling to survive on a day-to-day basis. That groundfishery certainly depends on healthy cod stocks, but it also depends on New England’s fishing families and fishing infrastructure, particularly the inshore fleet, being able to carry on against the overwhelming threats posed by the measures released today. An unprecedented scientific collaborative research effort to determine what the actual condition of the cod stock is with the real, engaged partnership of fishermen who stand to lose their livelihood from today’s announced measures. That effort must determine why the many strict measures that have been undertaken to date haven’t worked, and why the tremendous hardships that have been sustained because of them haven’t produced a healthy cod stock. Immediate measures to preserve and protect New England’s domestic fishing infrastructure, including vessels and shoreside facilities. Financial assistance for those who depend on groundfishing for their income. Given the severity and immediacy of these emergency actions, NOAA, the New England federal legislative delegation, and its counterparts in state government can’t afford to wait for them to do damage, we all need to move forward now to develop and implement a plan to mitigate that damage before it’s too late. To read NOAA Regional Administrator John Bullard’s statement on the issue, please click here. Posted below is a map of seasonal closures affecting Gulf of Maine cod. “I congratulate Governor-elect Charlie Baker on his win in yesterday’s statewide election. Charlie ran an upbeat campaign that engaged the state’s voters and focused on his positive vision for creating jobs and moving Massachusetts forward. His ability to lead and to understand the problems that face the state will serve us well, and I anticipate that, beginning on day one, he will work with legislators on both sides of the aisle to achieve a bipartisan consensus to address these problems. I look forward to working with the new administration over the next four years to help make Charlie’s vision for a better Massachusetts a reality. With the polls opening today at 7:00am, Massachusetts voters will get the opportunity to cast their vote for several candidates and ballot questions. Several important elected officials will to be chosen today, including Governor, Lt. Governor, Treasurer, Auditor, Attorney General, Secretary of State, U.S. Representatives, State Senators, State Representatives, and Executive Council Members. · Question 4 allows workers to earn paid or unpaid sick time. Polls close at 8:00pm tonight, and it is essential that everyone exercises their right to vote. To learn more about the ballot questions please click here to visit the Secretary of State’s website. To find your polling place and the candidates on your ballot please click here.